Sesuvium is an introduced native plant, called ʻakulikuli, with fleshy, succulent leaves, red stems, and purple flowers. 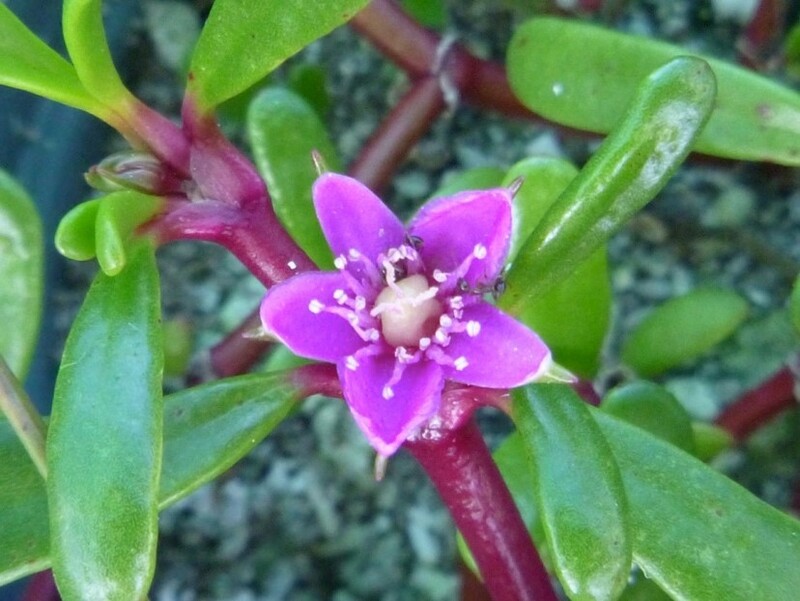 The succulent leaves of Sesuvium are relatively distinctive, only resembling Portulaca oleracea on Kure. Sesuvium leaves are much longer and more slender than Portulaca, and the purplish red stems and magenta flowers are also good identifying characteristics. With heavy metals still existing in the freshwater lens from the days of the Coast Guard coupled with the threats of botulism for Laysan ducks, there was a need on Kure for a plant that could grow in and out of the water. It was introduced using cuttings from Midway as there was a need for low-profile marsh plants in preparation for the translocation of a small Laysan duck population in 2014. It has the ability to pull nitrogen and heavy metals out of water sources-creating soil high in good microorganisms and high water quality. It also creates foraging habitat for shorebirds and ducks. It is not common and has been successfully outplanted mostly in wet areas such as the seeps and at the West Landfill at the west end of the runway.